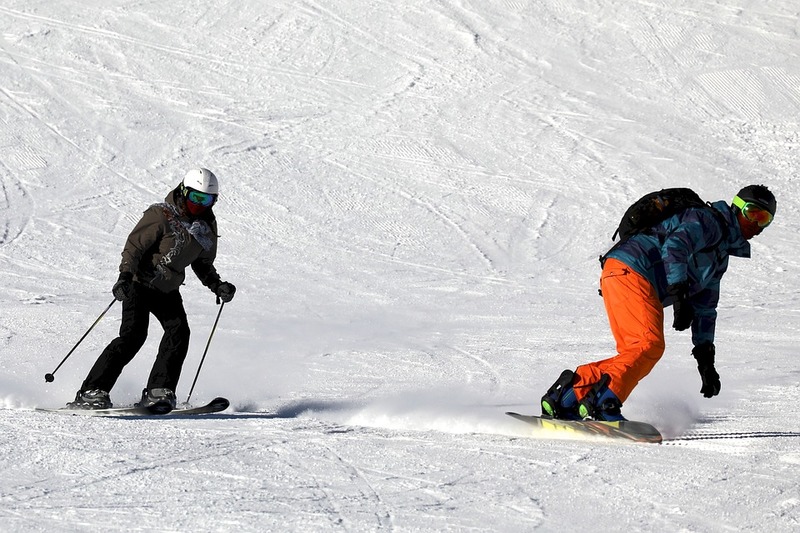 Skiing vs Snowboarding: Which Is Better for You? >> Skiing vs Snowboarding: Which Is Better for You? There are so many different snow sports to do during the winter. Sledding, ice skating, and snowshoeing are all common sports that people enjoy doing during the snowy months. Two snow sports that are similar to each in many ways are skiing and snowboarding. Over the years, many people have wondered the difference between skiing vs snowboarding. While skiing requires two skis and poles, snowboarding simply requires a board that you stand on. If you have been wondering about skiing vs snowboarding and what the differences are, you have come to the right place. 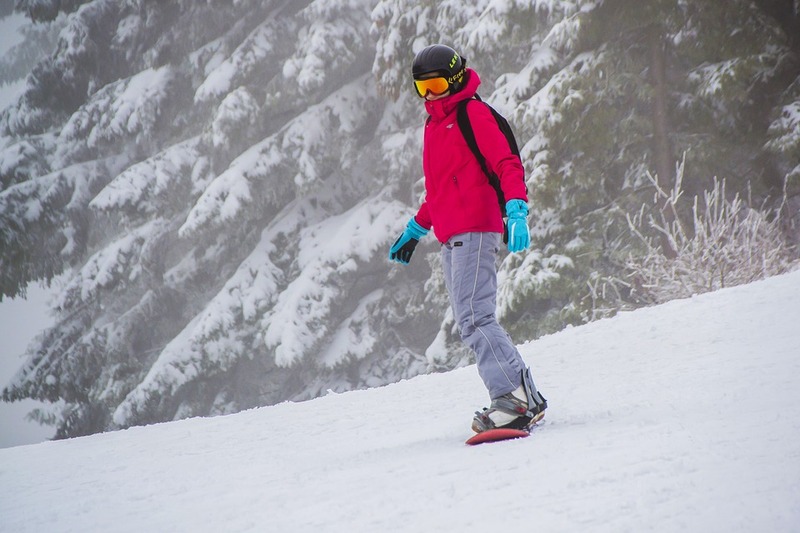 In this article on skiing vs snowboarding for beginners, you'll learn everything you need to know about the differences between these two sports. You'll also learn how to ski and snowboard. So, let's get started. What's Easier to Learn: Skiing or Snowboarding? One question that may pop into your mind is this: is skiing or snowboarding easier? While they both require leg strength, skiing is considered easier to learn. With that being said, it is also considered harder to master. Snowboarding, on the other hand, is difficult to learn, but easier to master. In other words, you can quickly learn how to ski, but it takes a lot of practice for you to get really good at it. Snowboarding, however, is harder to learn, but once you get the hang of it, you have mastered almost everything you need to know about snowboarding. When it comes to skiing vs snowboarding, they each have their pros and cons. While skiing has been around for quite a long time, snowboarding is a newer snow sport that began in 1965. Snowboarding was thought to be cooler than skiing long ago, but that idea has since then faded away. These days, both skiing and snowboarding are thought to be equally fun. Skiing is easier to learn. You have poles to help you get around. Getting off of lifts is easier for skiers. Skiing is harder to master, even though it is easy to learn. You can get injured if you don't fall correctly. Ski gear costs more than snowboard gear. You can easily walk in snowboarding boots. Snowboarding boots are also considered much more comfortable than ski boots. Once you have mastered snowboarding, you have learned almost everything you need to know. Snowboard gear is cheaper than skiing gear. Lifts are designed for skiers, so it can be difficult to get off of them. Snowboarding is difficult to learn. When there is an uphill, you have to take off your bindings and walk up the hill. The first step to skiing is putting on the boots and skis. When you put on your boots, you may want to walk around in the boots first to get used to them. To put the boot into the binding, you need to make sure the boot is leaned over at the same angle as the ski is. Slide the lip on the front of the boot into the toe cup on the front of the binding. Line the heel of the boot up with the back of the binding, and bring the heel of the boot down into the heel cup. Once the heel is inside the heel cup, push down on your heel until the heel cup clamps down and the binding lever clicks up. As for getting your skis off, push down on the back of the bindings until your heel pops up. You can use your ski pole to help with this. The first step to moving in skis is to learn how to move on flat terrain. 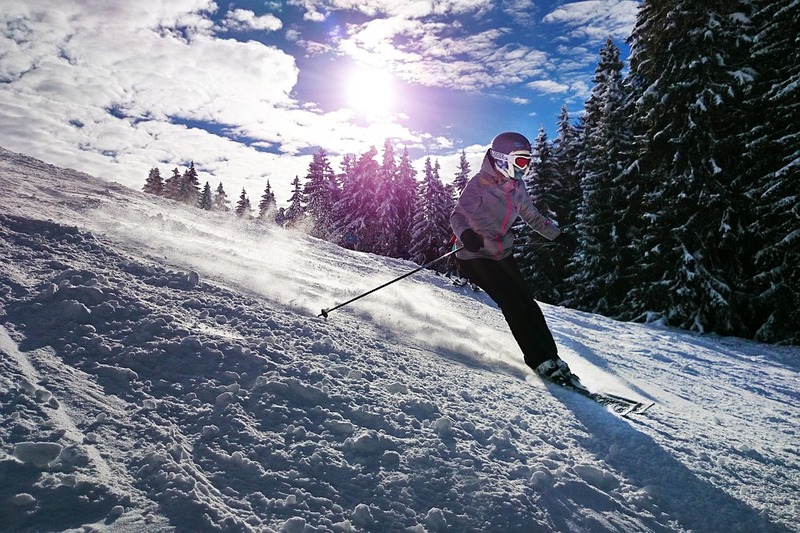 As you get skilled, you can start skiing on hills, both uphill and downhill. One of the most common ways to move over flat terrain is to keep the skis parallel and push yourself forward with your poles. Though most of this article was about downhill skiing, if you will be going uphill, you really should have cross country skis on. 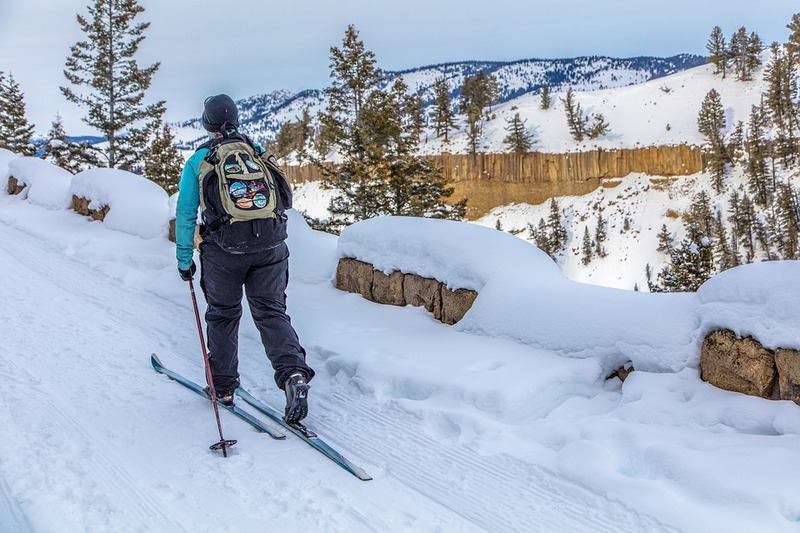 There are several different methods for walking uphill on cross country skis. One method is to try to "side-step" up an incline. At the slope of a hill, stand sideways. Dig the uphill edges of your skis into the snow and take small steps uphill. Keep the skis perpendicular to the slope right where you are, and use the poles to keep you from slipping as you work your way sideways up the hill. This is the easiest and least tiring way to get uphill. Another method to try is the Herringbone technique. It is named after the fish-bone patterns the skis leave in the snow. To use this method, point the front tips of your skis away from each other, so they make a "V" shape, and take small steps forward. Tilt the leading edge into the snow and push forward to prevent slipping back. Bend your knees and lean forward a little as you walk up the hill. On steeper hills, you'll want to spread the skis more on steeper hills. Your poles will help prevent you from falling over. The last method is the skate-skiing method. This is the fastest way to get up a hill. Angle the skis as if to do the herringbone method, but allow yourself to slide forward smoothly. Dig your one ski into the ground and then kick outward. Repeat this with the other leg. If you are on a steep slope, you can easily transition to the herringbone method. In order for you to easily ski, you must learn the proper posture to have while skiing. Bend your knees so your shins rest on the front of the boots and lean forward slightly. Although you may feel like leaning back when you are about to fall, this does not help control your skis. You should always lean slightly forward. Put your hands through the straps on the ski poles and hold the poles by your sides. Learning how to stop on skis is another very important step. This will prevent you from falling when going uphill and downhill. When trying to stop, point the front tip of your skis together, then push your heels out to form a wedge. This is known as the "pizza", "wedge", or "snowplow". The wider you spread your skis, the slower you go. If you find yourself sliding backward, spread the tips apart (herringbone) behind you. Learning how to make a quick turn can be difficult at first. You must make sure you know how to do the "pizza" before you attempt to make a turn. To turn, all you have to do is point your feet (and your skis) in the direction you want to travel. For a strong parallel turn, push the "outside" ski away from the body, keeping it parallel to the direction of travel. For an extra smooth carved turn, tilt the outside ski's ankle to towards the snow. You should feel the ski cutting into the snow to help you turn, rather than sliding sideways over the snow. If you want to stop while turning, keep your feet in the pizza position and turn across and slightly up the hill. The most dangerous part of skiing is falling. Many people end up in the hospital due to severe falls. The main reason why people get hurt when skiing is because they don't fall properly. They usually try to stop themselves from falling, which causes them to get hurt. If you find yourself falling, simply fall to your side. When possible, fall uphill as you are much less likely to get injured when you fall uphill. Getting up from a fall can be very difficult. If you find that you are not making any progress, you can take your skis off and put them back on once you are up. This takes time, though, so the best method to try is to move so that your head is towards the top of the hill and your feet are at the bottom. Get your skis perpendicular to the slope, and dig the inside edge of the bottom ski into the snow. You can push up from the slope using the hand closest to the slope, or try using your poles. There are many different snowboarding styles to choose from. These snowboard styles include the following: All-mountain snowboards, freeride snowboards, freestyle snowboards, and alpine snowboards. You can learn more about the different snowboard styles here. To begin, you'll need to strap your feet onto the snowboard. There are two common types of bindings. There are strap bindings and speed entry bindings. Strap bindings are the most commonly seen snowboard bindings. They consist of a base for the bottom of your boot and a set of secure synthetic straps (usually two straps) that are tightened over the boot to lock it into the base. Speed entry bindings look similar to strap bindings, except the back of the boot base (called the “highback”) has a hinge that allows you to slide your foot in quickly. Speed entry bindings are more expensive. To get onto your snowboard, put your lead foot in the front binding. Fasten your bindings tightly and be sure the base of the binding fits your boot snugly, then repeat for your other foot. Next, stand up and don't turn your snowboard so that the lead end of the board is pointing down the hill. Learn to slip down the fall line sideways first. To move to the side, shift some of your body weight to one of your feet. Use that foot as a pedal to turn more or less downhill. Learn to control your movement direction while keeping most of your weight on that foot. Remember to keep your knees slightly bent and your back straight to help you maintain your balance as you gather speed. Garland is a turn without the edge change. To do garlands, lean your body into the side of the slope to put weight on one edge of your snowboard. The edge your feet are pointing towards is the "toe edge", and the edge behind them is the "heel edge". Make sure to control your garland with weight shift. It is a good idea to have most of your body weight on a front foot (lean forward) when the board is headed down the fall line. Use weight shift to control your garlands and turns. Maintain a straight back and bent knees as you do garlands. Turn your snowboard so that you're perpendicular to the slope of the mountain. Lean back into the slope of the hill as far as you can without falling over. This will put almost your entire weight on one edge of the board, which allows you to slow down quickly. As you lean into the hill, lean back on your rear foot at the same time. The more you lean back, the faster you'll stop. That said, don't lean back onto the back foot when trying to turn and stop. When you are turning, you should always have your weight on the front foot. Once you're ready to continue, shift your weight diagonally so the board starts turning downward. 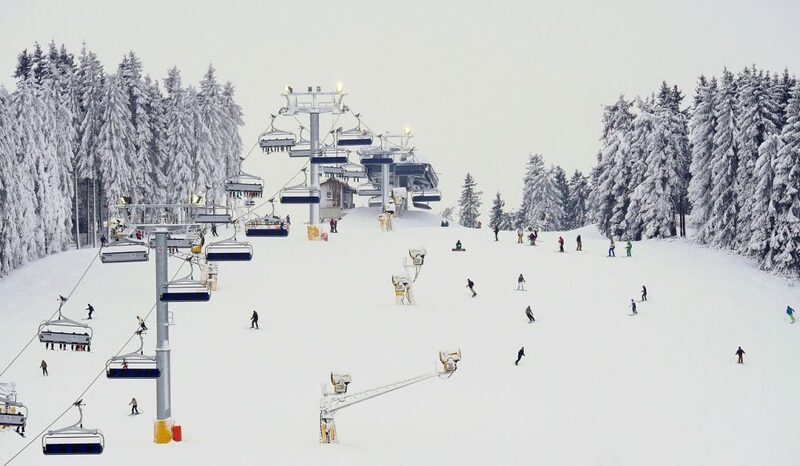 If you have been wondering the differences between skiing vs snowboarding, hopefully, this article has answered all your questions. Skiing is easier to learn, but snowboarding is easier to master. Even though snowboarding was once considered more cool and better than skiing, both of these sports are popular these days. In conclusion, both skiing and snowboarding are great sports to try. Have fun this winter!